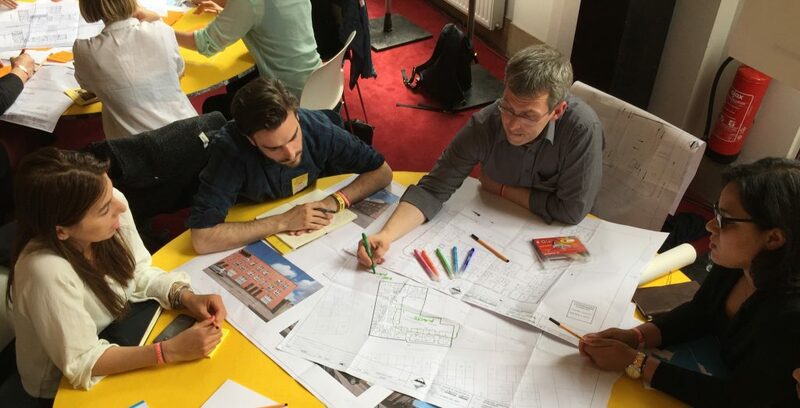 Dublin City Architects through the PIVOT Dublin platform is doing a 2015 Pilot project around challenges faced by owners and residents of private apartment complexes in the city. Called The Empowered City, the Pilot draws on The Design Assistance Programme, a strategic initiative of the American Institute of Architects (AIA) Center for Communities by Design. Through this programme, over 1,000 professionals from more than 30 disciplines have provided millions of dollars in professional pro bono services to more than 200 communities across the U.S. engaging thousands of people in community-driven participatory process. City Architects and the Center for Communities by Design are holding a two-day workshop with participants drawn from a range of disciplines. The objective is to establish a pool of potential volunteers for Stage 2. We have architects, artists, communication specialists, graphic and product designers, financiers, engineers, lawyers, scientists and planners involved. City Architects and the Center for Communities by Design will engage and guide a project in Dublin, working with a group of apartment residents and a team of volunteer practitioners. The Apartment Owners Network will help select the apartment group. The goal of the Empowered City Pilot is to build the skill and capacity of programme participants to design and implement an adapted form of Design Assistance processes for Dublin communities. The Pilot outcomes will determine how to proceed with an expanded programme across Dublin and Ireland. ‘The Empowered City’ draws on the PIVOT Dublin Hidden Rooms initiative which kicked off with a city wide conference hosted by Dublin City Council on the 24th and 25th November 2014. On the first day, 350 people from diverse backgrounds and areas of expertise gathered in groups across Dublin to work on one of 16 city challenges. Each group was asked to devise a solution, framed as a pilot project proposal to be actioned in 2015. On the second day, all groups came together to discuss their proposals. A third of all homes in Dublin City are apartments or flats. There are excellent examples, however, many developments are compromised by a range of legacy issues – design, construction, management – and apartments are not considered an optimum long term housing choice. This is impacting negatively on people’s quality of life and is a fundamental obstacle to developing the city. We need to build apartments to meet the needs of a growing population and to avoid urban sprawl. While improved regulatory controls and standards will help deliver better quality in future, how should we (Dublin City Council) deal with existing developments? Should we be concerned about improving quality and liveability for the benefit of residents, the reputation of apartment living and the overall quality of the built environment?